I simply adore my little Lace Smoke Ring… It was such a pleasure to work on this little project, I just couldn’t stop knitting! 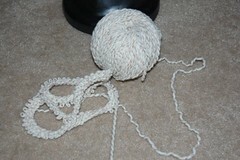 Instead of casting on 168 stitches and starting with chart A, I skipped Chart A alltogether and moved directly to Chart B. Because I start with Chart B, I casted on 156 stitches and disregarded the very first decrease in the first round. According to the pattern, one has to knit Chart A once, Chart B once, Chart C once and then finally Chart D several times untill the piece measures 18″. I however did Chart B twice, Chart C twice and Chart D I repeated untill I ran out of yarn. I am happy with the result, however, next time I will make the cowl narrower. Allover, the pattern is repaeted 12 times and next time I will repeat the pattern only 10 times. Also with my second cowl, I will skip chart A and also chart B because I don’t want it to flare so much… When it flares that much, I feel like I am wearing a bib! 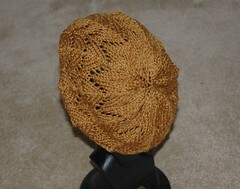 For this lace project I used the Lace Addis. 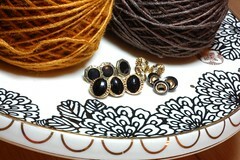 Really, it makes such a huge difference when you are knitting lace. The tips are elongated and very pointy, the joints are like always with Addi needles, so incredibly smooooth. Ah, it really helped enormously to make this project go as smooth as possible! How did I find the lace pattern itself? 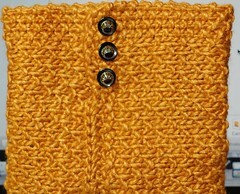 The lace pattern itself is a 8 round repeat stitch with a multiple of 10 basic stitches. What really makes this pattern interesting to me are the big fanning eyelets caused by double yarn overs. So incredibly pretty…sigh. 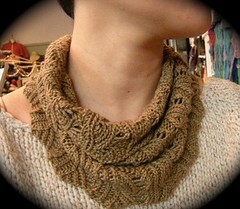 Also, basically this is a rib based pattern with regular purls but lots of knitting through backloops. 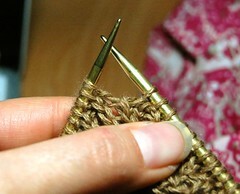 This causes the knit stitches to pop and by doing so, it creates very distinctive knit stitches. I simply adore that! The very first 8 rounds gave me a hard time and it took me awhile to get acquainted to the pattern. As difficult as it was at the start, just as easy it became after the first 8 rounds. So easy that I did not have to look at the pattern on my sheet! 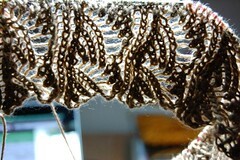 Next to the Feather and Fan and Horse Shoe Lace pattern, this is the third lace pattern I find incredibly easy to knit. Simple and fast, yet extremely elegant. Minimum effort for maximum effect. I LIKE THAT! 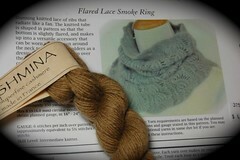 For those who shop at CloseKnit’s, I am happy to report that Sally decided to order the Flared Lace Smoke Ring. When she saw me working on the pattern, she liked it so much that she had to have it in her shop! I was able to get my hands on the Flared Lace Smoke Ring by Jackie Erickson-Schweitzer… I was thrilled beyond belief when I came home and felt like a child who just got her favorite toy! 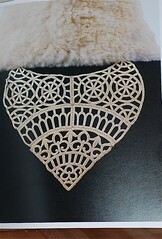 You see with knitting lace you really have to be familiar with the pattern. You need to know where you are within the pattern so that you can catch yourself when something goes wrong. It’s like being in a new city. You don’t know you way around and you are kind of lost. Whereas when you are in a city you know well, you can correct yourself immediately when you make a wrong turn. Or you know exactly what cross street is next. You can navigate well and you know exactly where you are. Well let me tell you…I got lost in the pattern…terribly lost and I messed up so badly, and the delicious Qiviut was so thin and fuzzy and got so terribly entangled that I could not save the part I had been knitting with. Dang it… that’s what you get when you don’t heed the voices in the back of your head! 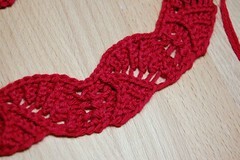 I quickly casted on again with some red DK weight scrap yarn, and bravely started anew. It took me several attempts but after a while I finally got it! Afraid though to waste more expensive Lace Qiviut , I decided to work with another, slightly heavier yarn: Pashmina by Joseph Galler. I am very happy with my project now. The pattern is simply gorgeous and once you get past the first 8 rows it’s easy breezy! If I may make a suggestion on a terrific lace hat pattern: you all should knit the Spring Beret by designer Nathalie Larson! It is so much fun to knit, I really enjoyed it. Guess what. I don’t like beanies! So I will give it to somebody who does. Whether one likes or dislikes, agrees or doesn’t agree with Sarah Palin is not the issue here. JUST LOOK AT THAT GORGEOUS COWL. I want it. I want it baaaaaad. 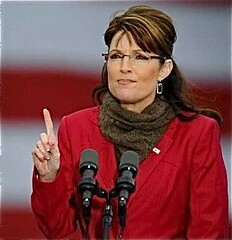 When I saw Sarah Palin wearing this cowl I it struck me as some what familiar, as if I had seen it before… that gorgeous lace pattern. After some brain cracking, I remembered vaguely that I had seen it somewhere on the internet at some knitting blog…but which one..? 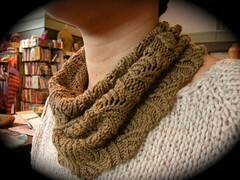 And so began the hunt, dear reader, for the lace cowl that resembles Sarah Palin’s Cowl. It took me a little while but I think I found it. I wish I had a picture of it but I don’t. So click here to see what I am talking about! 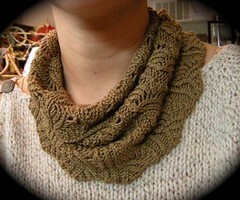 It is a gorgeous gorgeous lace cowl by designer Jackie E-S, and I think it is the closest thing to Sarah Palin’s Cowl. Of course this topic has been discussed by knitters on Ravelry and many options of patterns were thrown in the mix, but to me this Flared Smoke Ring is simply it. I am assuming it is Qiviut that Sarah is wearing, simply because she is from Alaska and Qiviut is from the Alaskan Musk Ox. 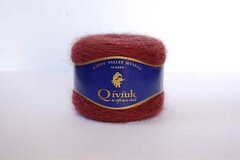 And what do you know, I’ve got some Qiviut in my stash! I am very very excited about this!!! Finally I found a suitable project for my precious Qiviut! How excited I was in my last post about this hat. All the excitement is gone now. The hat came out waaaaaay to big and I did not like the outcome at all! So I frogged it. Immediately. No mercy. I don’t even want to tweak the pattern to make it more to my liking. 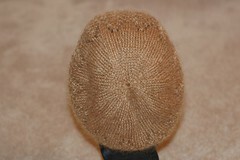 It was such an incredible bore to knit, purling in the round for rows and rows on end. Yuck. No thanks. 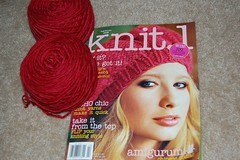 On to the next hat project: Spring Beret by Natalie Larson. Just the other day, while I was working at the yarnshop, this lady came in wearing a beautiful knitted hat. 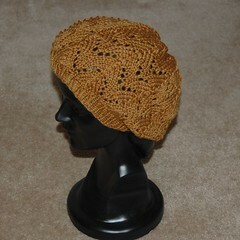 She shared with us that the she had found the pattern on Ravelry and that it was called Spring Beret. It is a super quick knit, worsted weight yarn, needle size US 8/ US 9 and the lace pattern (horse shoe) is so incredibly easy. I like the outcome allthough it is a little bit too big. I like the pattern so much that I am going to knit the smaller version and fingers crossed that I will like that outcome better than my first one. 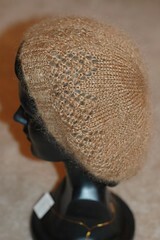 High five to Nathalie Larson, designer of this beautiful Spring Beret! I am all about hats, lately… For the longest, I haven’t been really interested in hats and knitted only sweaters and tops before I even had knitted my very first hat. It’s a different story now… all I can think about are hats and I am on the hunt for just the right hat patterns. You see, I’ve got a big head…and I am very peculiar about how my hat should fit. Finding the right hat pattern to me is like finding the right pair of jeans: it’s gotta fit just right. And once I find the right one, I can’t stop making them. 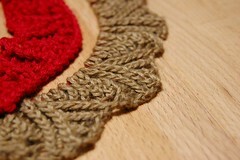 But having knit those multiple times, I thought it would be nice to move forward and find a new pattern to play with. 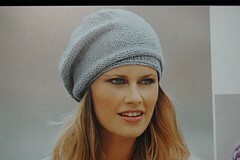 How happy I was when I saw this beautifully cabled beret on the frontpage of magazine Knit!! I immediately bought some skeins of Manos Solid and was more than ready to knit this very cute hat! I had however, several concerns about the pattern… First of, the entire hat is knit with two strands of Manos and you have to start with circulair 16″ needle US7. That’s an awful small size for double stranded Manos. Secondly, at one point you have to switch to a circulair 16″ needle US11 and increase stitches untill you have 144 stitches on the needles. Woah. 144 stitches of double stranded Manos on a circulair 16″, that’s going to be awfully crowded. I did not heed those two red flags and optimistically casted on. And guess what… US7 with two strands of Manos, uhm… no. So I switched to needle size circulair 16″ US8. Once I had to switch to the bigger size needle, my hands were already hurting and I got pretty annoyed. Then after I did all of the needed increases and I had 144 stitches on my 16″ US 11, I was even more annoyed. Yup, crowded it was! Just too much stitches and thus absolutely nearly impossible to comfortably knit! My hands were hurting, too much stitches crammed on my circulairs and I my annoyance level went up sky high. Finally, I give up and abort the project. It’s a cute pattern… but cute alone don’t cut it. It has to be a pleasant experience for me to knit a project and the way I was feeling was far from it. I can’t linger too long in disappointment and hunted for the next hat pattern and found one in a Filati accesoires booklet. Ahhh… so cute! I just cannot wait to make this one! 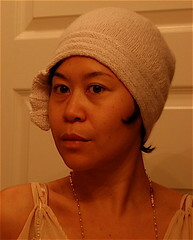 Can you believe I knitted this cute cute cloche by Laura Irwin and then I forgot to blog about it! Bad Nancy. Look at how lovely this hat came out! 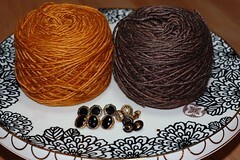 The pattern is in Laura Irwin’s book Boutique knits and calls for 2 balls of Rowan Lux. A quick and entertaining knit. So…what are you waiting for? 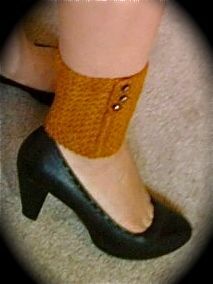 Go get yourself a copy of Boutique Knits and make yourself one too! Well, JaNae, I am happy to tell you that your Golden Moment is here! 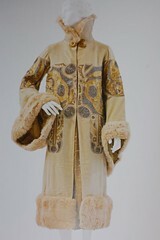 You were right, it’s Paul Poiret, one of my all time favorite designer. Want to see what you have won? May I suggest a project for these yarns? Why don’t you use the Manos Silk Blend to make my Long Scalloped Fingerless Gloves Adrienne? 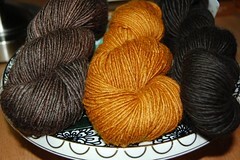 And the Suri Merino you can use to make the Sally Fingerless Glove! I will include the pattern for you for free! If you are worried you won’t have the right needles for these projects, don’t worry… In your package I will include the right needles and some cable needles too. 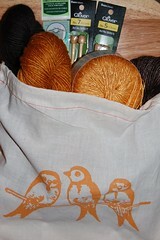 And besides that, what’s a knitter without a cute little project bag? Of course, JaNae, these projects are only suggestions. You can do whatever you wish to do with all of the yarn you won today! Congratulations! Just the other week when I was knitting away and sipping my Hazelnut Latte in a coffeehouse, two women sat right next to my table. At first I assumed they were grandmother and granddaughter, but when the younger woman addressed the older lady with her last name, preceded with a respectful “Mrs.”, I knew they were not connected by kinship. What struck me most while watching these two woman interact was the respect and love they both gave to eachother. The younger woman would continously make sure the older lady was completely comfy; “Is your coffee just right, Mrs Johnson?”, she would ask while touching her arm. “Are you sure your chair is comfortable enough, Mrs Johnson?”, she would inquire, ready to jump up to find a more suitable chair for her older friend. The older lady on her turn, would inquire about the younger woman’s well being and life, ready to give her gentle advice when asked for. In response, the younger woman jumped up and gave her dear friend a warm hug. And at this point I put down my knitting and hide behind my cup of Hazelnut Latte, pretending to be busy drinking my coffee, and hoping nobody notices my teary eyes. Knitting has become something so precious and dear to me that at times, I cannot remember how I was before I picked up the needles. However, after some digging into the past I vaguely remember that I would cook more often. And I would read a lot. Not to mention watching TV! I would watch TV a lot and I remember how bored I felt while doing it. Knitting has enriched my life. It has made me more creative, it has brought moments of pure passion, it has driven me to near madness if I was not able to figure something out, it has also truly brought me joy. Hours and hours of joy! So… how was your life before knitting, I wonder? Do you remember? 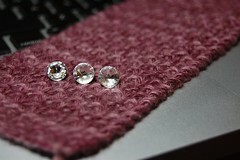 I am all into daintly little projects… First of, I have been working with some cashmere from Artyarns. I love how it feels around my neck; so incredibly soft! So I wanted to create a daintly little choker with fancy buttons. I still have to finish it. Just have to sew it up with the buttons and it is done. More pics will follow beginning of next week! Say what? You want a more detailed photo of my ankle warmer? Sure! 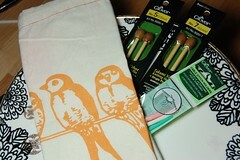 In my last post, Golden Satisfaction, I issued, rather impulsively, a little contest. 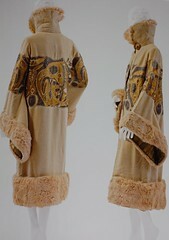 I put up some pictures of beautiful fashion designs and asked whether you would know the name of the designer. Spider came up with designer Elsa Schiaparelli, Tiferet thinks it might be Russian designer Erte, and JaNae is certain it’s Paul Poiret. Just the other day, when I was on a mission to get a book at Powell’s in downtown Portland, I could not help but notice how a warm feeling came over me… for no particular reason. I walked in a slow pace, no hurry, and I as I tried to analyse this warm feeling, it struck me how golden this warm energy that suddenly came over me felt. I paused for a moment, stood still in the middle of the sidewalk for just a second as I suddenly was able to put my finger on it: satisfaction…I was filled with a feeling of satisfaction for no particular reason. I tried to sum up reasons for this sudden golden feeling of satisfaction but immediately stopped myself. Some feelings should not be analyzed and be broken down. Some feelings just come as they come and best to just enjoy it. Ah, how delicious Manos Silk Blend is… I loved this yarn by Manos del Uruguay from the first day it arrived at the store last year. I have taken home many a color except for the ones with a golden glow to them. So I chose a warm golden color and a dark bronze color, quickly wound them into balls and once home, I immediately selected some little dainty buttons… ah what to make, what to make..? Sometimes, I just assemble the materials and just stare at it for several days. Then, suddenly, it will hit me. Until then, I keep on dreaming. 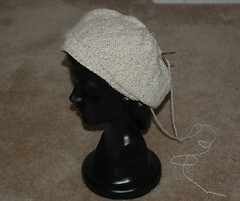 I know… I have made the Portia hat by Louisa Harding already 3 times before. 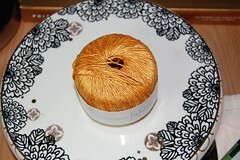 This time I desperately wanted to see how it would look in Kidsilk Aura in of course a goldeny colorway. The pattern calls for dk weight yarn and since the Kidsilk Aura is a aran weight I had to tweak the pattern a bit. Came out fine! I just love how beautifully the decreases line up. Just cannot take my eyes off of it! 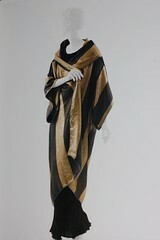 Other golden inspiration: who is this designer? Today I leave you with some beautiful fashion pieces… can you guess who designed these? Yup, this is a little contest, it will stay open for a week. Leave me a comment with the designers name! Good luck! I am very curious to see who will come up with the right answer! You are currently browsing the Getting Purly With It blog archives for January, 2009.